I’ve been working on telephone systems for a while. And I love my job. For the past few years, I find myself working with network administrators who have been handed the job of managing the telephone system. It makes sense – the PBX is just a big voice router, and nowadays the telephones are IP network endpoints. Know how to transfer a call into voicemail without ringing the station. Know how to conference two parties together. This includes two inbound calls. Also, learn the limits of conferencing. How many parties can conference together? Can your users transfer calls outside the PBX (i.e. to mobile numbers)? If so, what happens if voicemail picks up at the far end. How do you pull that call back? What about when you attempt to conference rather than transfer? Learn what all the feature buttons do, like park, call pickup, do-not-disturb, or any one of about 200 possible features. Know how to program the speed dial buttons. Keep a list of conference rooms and the speakerphone numbers handy. Get to know you receptionists and find out what they need in a telephone system. They probably wish they had an accurate company directory, right? In a later post I’ll talk about how to provide this. Spend time walking the floor and interacting with users. When someone calls for a simple change that can be performed remotely, go visit the user or at least give him or her a call. Try to chat about how they use the phone. Learn how to create an out-of-office greeting and activate/deactivate it. Learn how to leave a voicemail for someone without ringing their telephone. The goal is to know the system well. You want people to think of you when they are trying to do something new. When you’re visiting, discreetly listen to the interaction with callers. I cannot tell you how many times I’ve heard “You’ll have to call back and ask the operator” or “His extension is 8244 but you’ll have to call back. I cannot transfer from here”. Try to help these people understand how to use the phone. Of course, some folks don’t want to hear it but some do. Be helpful. Know your telephone system. Be the Authority. What types of questions do you get? This entry was posted in pbx, voice on July 30, 2012 by roger. It’s not that I’m an “Avaya guy”, but it just happens to be the system I’ve been working with lately. 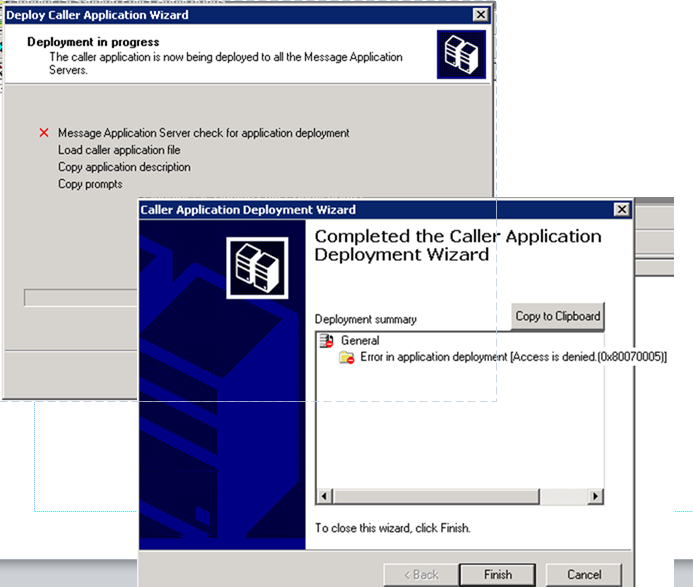 If any of you have tried to publish a caller app on Modular Messaging and gotten the message Error in application deployment (Access is denied (0x8007005)), there’s an easy fix. You can then deploy apps remotely. Simple, but since I couldn’t find any quick info when I googled the error, I thought I’d post it here. This entry was posted in Avaya, pbx, voice and tagged Avaya MAS on February 1, 2012 by roger.